It has been quiet around here hasn’t it? I don’t know what has been happening but I have a belief that somebody has stolen around 8 hours out of my every day. I have to confess that I am all behind and scatter-brained. I have lost track of what is reported and what is not. Fancy the briefest of catch-ups, just to be going on with? The birthday thing passed without too much undue stress. Dinner was excellent. That sherry was completely delicious and well worth stumping up for. The OAP bus pass has not yet been obtained. Few photographs have been taken and my blipping record is now appalling rather than simply poor. Some letters have gone back and forth but right now I would not care to say who has sent what to whom since I last reported on snail mail. A Log Book is required, I think. A little spinning has been done – we (Sanday Spinners) had an Open Studio event over the Bank Holiday weekend. The weather was fantastic and we were able to spin outside. 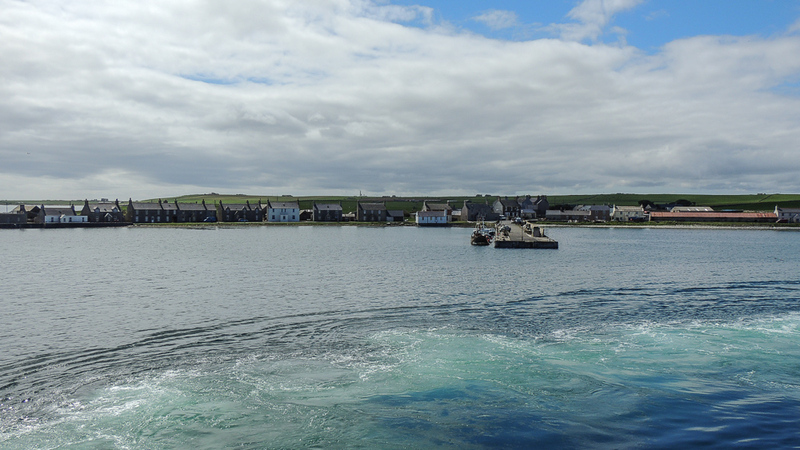 On the Sunday we went on the charter sailing on the MV Varagen and sailed over to Stronsay and then down and around Auskerry. It was a very pleasant outing. Planning is already in place for the next Soulka Open Studio at the end of June. Mr L has the DIY bit between his teeth and my life and my space are both in utter turmoil just now. He wants to sell up and move house. This is a large unknown in my life right now, and may be the cause of the lack of blogging. Everything is up in the air. I was in town on Tuesday, for a very long day – and one that involved my three least favourite activities. I visited the dentist and the hair dresser in quick succession and then had my photograph taken. An application form for the elderly person’s bus pass was obtained. I formed a conclusion that teeth scaling was less stressful than having a passport photo taken and that in turn was worse than the hairdresser. Who’d a tho’t it? On the journey in to town I tried to reply to a letter from Deborah Q (lettermo) but I ran out of ink. I doubted that I would find any Lamy cartridges in town, but I had success on my second attempt. The letter was completed on the journey home, more or less. I now need to post it. I filled in time (6 hours between boats) by the aforementioned haircut, a visit to Tesco (another despised activity) and trawling around the charity shops. While I was out a package arrived from Hunter Hammersen. Inside was my copy of her latest pattern book plus one each of the samples that I knitted for it, plus yarn to make the pair of each. I shall be blogging about the book over at Sanday Spinners just as soon as I can draw breath. Tuesday is a Big Adventure, as I have chosen to fly to and from Kirkwall rather than to spend such a long day in town when I shall be feeling in less than top form. It will be my first island-hopping flight. I plan to take the camera with me. What I want to be doing, is spinning. I had fun at the weekend and should like to play some more. It would stop me from thinking about the possibility of leaving my island idyll. It’s not just your part of the space-time continuum: I have no idea where my time goes either. I don’t envy you moving house. Hope you find somewhere just as lovely.